TEN-and-a-half months is a long time in politics … ask Theresa May. 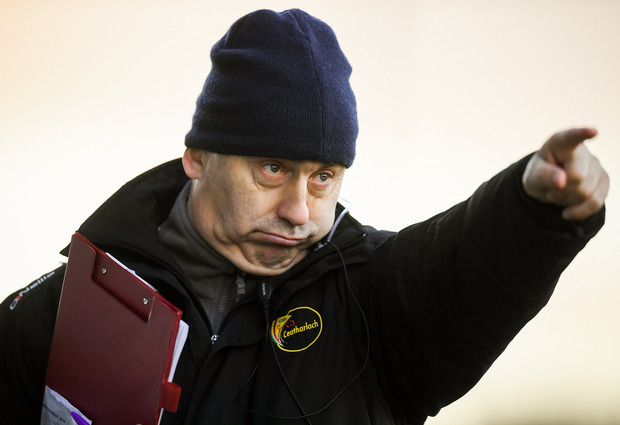 In footballing terms, it must seem a lifetime ago for Carlow manager Turlough O’Brien as he contemplates a 20-week suspension. Back in late May, his players did the unthinkable: they toppled Kildare in a Leinster SFC quarter-final. Coming on top of promotion from the basement division after a 33-year wait, these were giddy times for a county mired in near-perpetual minnow status. And how they embraced it. A few days later, they held a semi-final ‘press night’ in Mount Wolseley. For once, national papers were pointing their sat-navs for Tullow, keen to hop on this topical bandwagon. This column was there, and couldn’t but be won over by the infectious enthusiasm of O’Brien, his coach Steven Poacher and the various players present. “Expectations are great. I think they’re great because the expectation up to now was that we’d lose, and we always fulfilled it to the letter of the law,” the Carlow boss remarked. The triple-whammy missive from the Central Hearings Committee constitutes a hammer blow to a dressing-room already absorbing the body blow of relegation back to Division 4. This column wasn’t in Netwatch Cullen Park on March 16 when Carlow lost to an injury-time Down winner, but it’s obvious from various match reports that the hosts were livid with Cork referee James Bermingham. Their fury is even more apparent from the video, available online, which shows Bermingham surrounded as he made a beeline for the tunnel. GAA disciplinary chiefs have been cracking down on those confronting match officials this spring, but the punishments meted out to Carlow are the most severe yet, with the CHC suspending O’Brien for 20 weeks, Poacher for 12 weeks and midfielder Brendan Murphy, also for 12 weeks. All three were banned for alleged “threatening conduct towards a referee”; they can appeal to the CAC and, beyond that, to the DRA. What now for Carlow? An optimist will talk up their appeal room prospects. He might also remind you that (a) O’Brien and Poacher aren’t players so the actual team won’t be weakened; and (b) Murphy, for all his talismanic status, wasn’t around for last summer’s Leinster adventure, having opted for Stateside in tead. But what cannot be quantified, just yet, is the impact on team preparation and also morale. Amid all the platitudes last year, Carlow (and Down native Poacher especially) received plenty of critical flak from the naysayers, none more vocal than Joe Brolly, for their defensive set-up. As long as they were winning, they could bat it all away … but winning in Division 3 proved more problematic, even if they were competitive and unlucky to be squeezed through the trap door by Offaly. Now, with Offaly or a resurgent Meath up next, comes their greatest challenge yet: to ensure that ‘Carlow Falling’ doesn’t become the glib new headline to replace the Rising.